My most recently completed 12x12 layout. 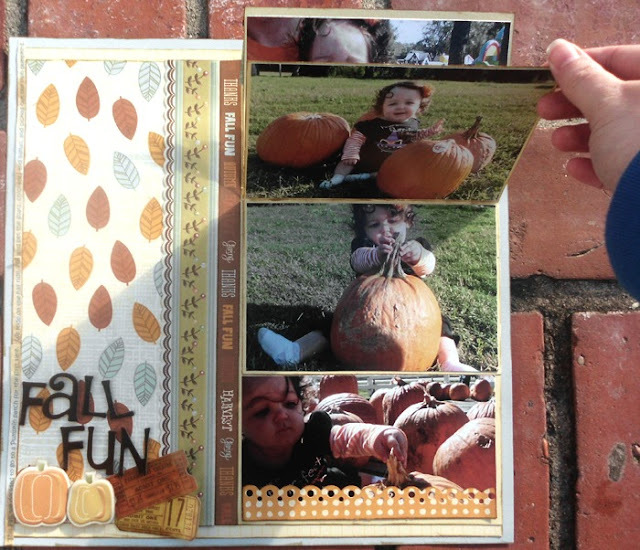 Fall Fun - showcasing all the adorable photos I took of Charlotte at the Pumpkin Patch. This particular layout is chock full of American Craft's Nightfall collection. 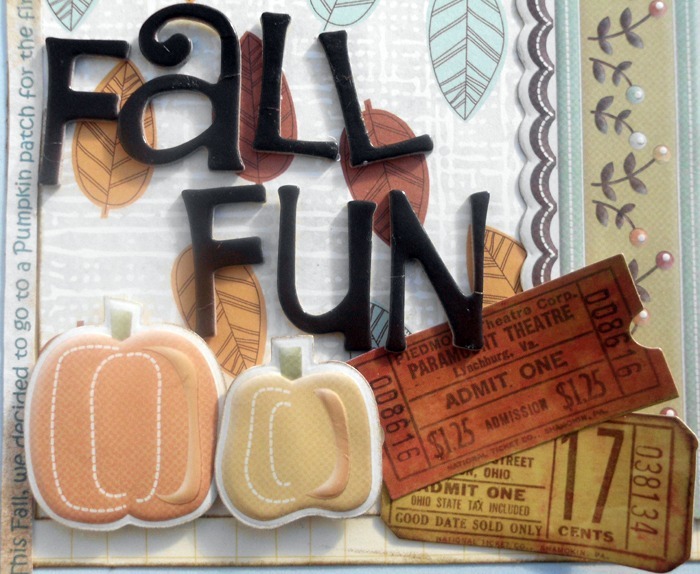 The papers (aside from the blue color cardstock), the borders, and the little pumpkin embellishments are all American Crafts. 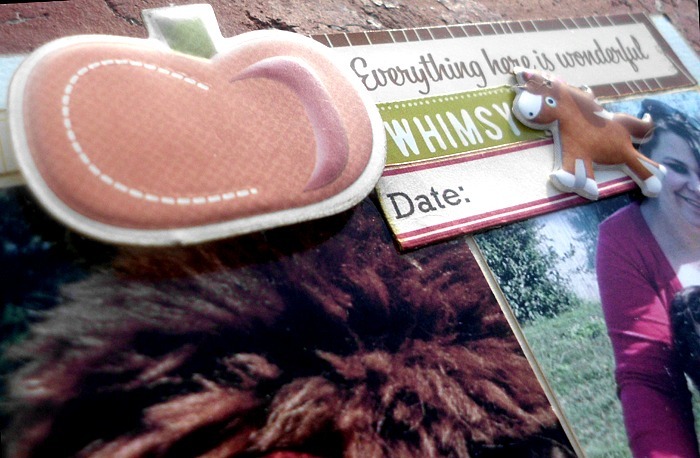 There is some Amy Tangerine thrown in there (whimsy sticker and "everything here is wonderful" sticker) along with some Tim Holtz tickets. The little pony sticker in the corner is from a pack of stickers I found at Wal-Mart by Jolee's Boutique (EK SUCCESS). Isn't it adorable? The whole set of epoxy stickers is full of adorable little critters. The vast majority of edges are distressed with my Tim Holtz Vintage Photo distress ink. Vintage photo is my absolute favorite. There is a little surprise to this layout. I made it an interactive page! The middle picture flips up to reveal 4 extra photos. :) I really love making my pages interactive. It adds that extra 'special' touch in my opinion - and more room for photos is always a plus! The journaling in this layout may be hard to see but it is along the side. I typed up and printed out a little 'blurb' about our pumpkin patch adventure, cut the journaling into strips, distressed it, and then just glued it on the layout. SOOOO cute! Love this lo so much! And that lil pumpkin of a kidd you have! She is so precious!!!! Super cute page!! :) I lived in Franklin VA for a while, very tiny like your town. 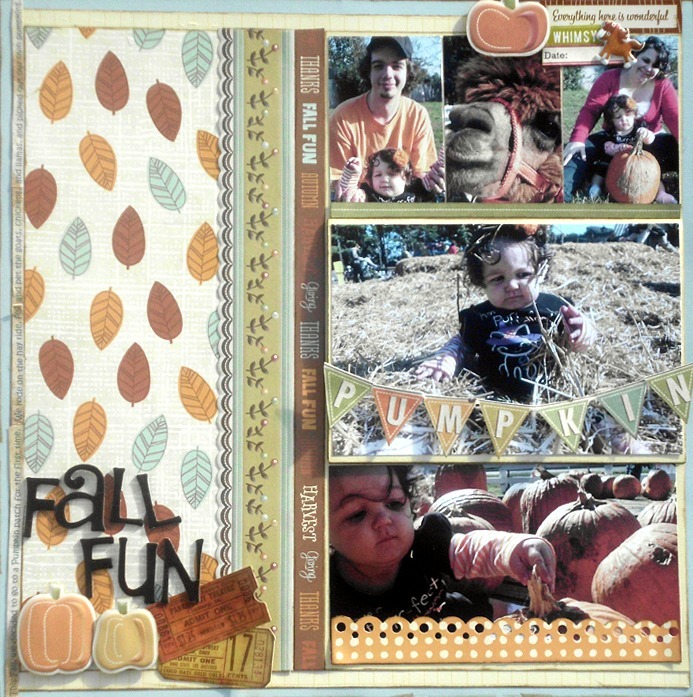 cute pics and a very cool autumn layout :D great job!